CORPIA Asset Management Ltd.является независимой и инновационной бутик-компанией по управлению частным капиталом в Дубае. Наши персонализированные решения и стратегии направлены на достижение наилучших результатов для наших клиентов. С помощью рынка Forex и Gold мы обеспечиваем наилучшую отдачу от инвестиций для наших инвесторов. На всей стадии инвестиций и реинвестирования клиент полностью контролирует этот процесс. На консультативной основе никакие транзакции не могут быть выполнены, пока клиент не будет полностью удобен. Наши консультанты уделяют достаточно времени нашим клиентам и знакомы с их подробными потребностями. Наш открытый и ориентированный на клиента подход ориентирован на потребности самых требовательных клиентов. 07.02.19 19:31	Transfer	Sent Payment: 200.00 USD to account U18150046 from U17755**. Batch: 245711374. Memo: Shopping Cart Payment. Deposit to corpiaasset.com User Knjaz. 02.07.19 20:00	Account	Receive	+10.00	Received Payment 10.00 USD from account U18150046 to account U17755**. Batch: 245713357. Memo: API Payment. Withdraw to Knjaz from corpiaasset.com. 6340909	+156.00	Received Payment 156.00 USD from account U18150046. Memo: API Payment. Withdraw to ProfitHuntersBIZ from corpiaasset.com. 6340909	+1.2	Received Payment 1.2 USD from account U18150046. Memo: API Payment. Withdraw to ProfitHuntersBIZ from corpiaasset.com. 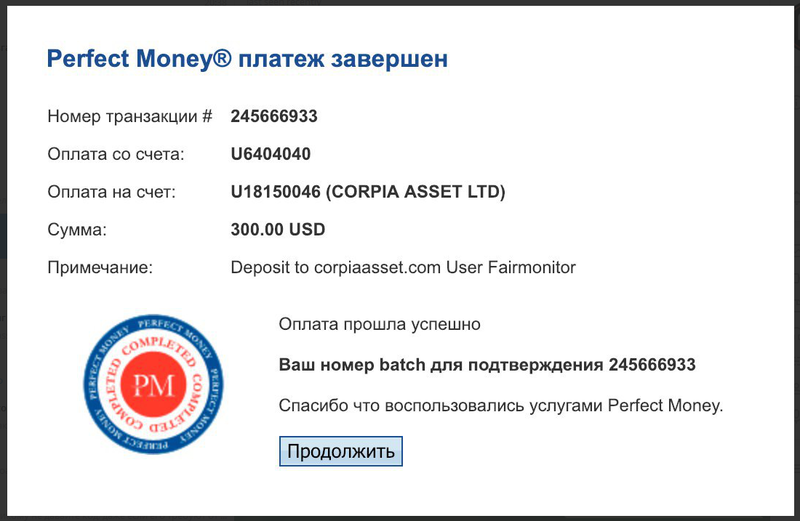 6340909	+203.00	Received Payment 203.00 USD from account U18150046. Memo: API Payment. Withdraw to ProfitHuntersBIZ from corpiaasset.com. 02.08.19 19:54	Account	Receive	+6.4	Received Payment 6.4 USD from account U18150046 to account U17755***. Batch: 245826382. Memo: API Payment. Withdraw to Knjaz from corpiaasset.com. 6340909	+24.00	Received Payment 24.00 USD from account U18150046. Memo: API Payment. Withdraw to Fairmonitor from corpiaasset.com. 6340909	+7.2	Received Payment 7.2 USD from account U18150046. Memo: API Payment. Withdraw to ProfitHuntersBIZ from corpiaasset.com. 6340909	+20.3	Received Payment 20.3 USD from account U18150046. Memo: API Payment. Withdraw to ProfitHuntersBIZ from corpiaasset.com. 6340909	+10.00	Received Payment 10.00 USD from account U18150046. Memo: API Payment. Withdraw to Fairmonitor from corpiaasset.com. 6340909	+15.00	Received Payment 15.00 USD from account U18150046. Memo: API Payment. Withdraw to ProfitHuntersBIZ from corpiaasset.com. 02.11.19 20:18	Account	Receive	+6.4	Received Payment 6.4 USD from account U18150046 to account U17755**. Batch: 246157896. Memo: API Payment. Withdraw to Knjaz from corpiaasset.com. 6340909	+21.00	Received Payment 21.00 USD from account U18150046. Memo: API Payment. Withdraw to Fairmonitor from corpiaasset.com. 6340909	+12.6	Received Payment 12.6 USD from account U18150046. Memo: API Payment. Withdraw to ProfitHuntersBIZ from corpiaasset.com. 02.12.19 20:13	Account	Receive	+6.4	Received Payment 6.4 USD from account U18150046 to account U17755***. Batch: 246290266. Memo: API Payment. Withdraw to Knjaz from corpiaasset.com. 6340909	+24.4	Received Payment 24.4 USD from account U18150046. Memo: API Payment. Withdraw to ProfitHuntersBIZ from corpiaasset.com. 02.13.19 22:14	Account	Receive	+6.4	Received Payment 6.4 USD from account U18150046 to account U17755***. Batch: 246434361. Memo: API Payment. Withdraw to Knjaz from corpiaasset.com. 6340909	+3.2	Received Payment 3.2 USD from account U18150046. Memo: API Payment. Withdraw to ProfitHuntersBIZ from corpiaasset.com. 6340909	+12.00	Received Payment 12.00 USD from account U18150046. Memo: API Payment. Withdraw to ProfitHuntersBIZ from corpiaasset.com.